Author Cynthia Roemer joins us today to share her thoughts on where faith and fiction collide. Cynthia holds a B.A. in English from U of I of Springfield, IL, specializing in creative writing. 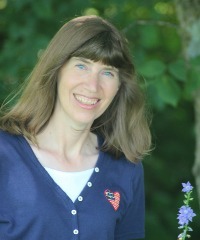 A free-lance writer since 1988, she has over 100 short-stories and articles printed in various Christian publications. Her love of history and writing culminate in this, her debut novel. Under This Same Sky is Book One in her Prairie Sky Series. Cynthia writes from her family farm in Illinois, where she resides with her husband, Marvin, and their two college-aged sons. Let’s give Cynthia a big welcome! Why does God allow bad things to happen to good people? It’s an age-old question that has yet to be fully answered or understood. The 2006 movie, End of the Spear, tells the story of five brave, young missionaries who travel to Ecuador to reach out to a tribe of natives who’ve never heard the gospel or even seen a white man. The team of missionaries, including Nate Saint and Jim Eliot and their wives, take up residence in a nearby village and begin to carefully plot their method of action. Phase one starts with them learning some of the language and dropping supplies via a small airplane in hopes of gaining the trust of this isolated people group. The next phase is to make physical contact and even give one native a ride in their plane. Finally, they land on the beach in an attempt to meet with them and share the gospel. But while things seem to be progressing in a friendly manner with the natives, an unexpected turn of events leaves all five missionaries brutally slain on the beach. Despite the fact that they had weapons, amazingly, they refused to fight back. Even more incredible is the fact that, after the violent death of their husbands, at least two of the missionary wives returned to work with the very people who had murdered their husbands. What a wonderful picture of grace and forgiveness. Their husbands’ lives hadn’t been lost in vain. Instead, their sacrifice had opened the door to fulfilling their dreams of sharing Christ with this unsaved people. These valiant men and women were willing to risk and even give their lives for the sake of the gospel. Their courage and commitment to the Lord took everything they had, but in the end became the catalyst to bringing many lost people to the Lord. I’ve always been intrigued and inspired by individuals who have given their all for the cause of Christ. People like Corrie ten Boom and Jim and Elizabeth Eliot who were willing to surrender their lives completely to the Lord’s bidding, no matter the cost. I think that’s probably why I chose to write about the theme of “total surrender” in my inspirational historical romance novel, Under This Same Sky. In the wake of heartache and loss, my main character, Becky Hollister, questions God’s love and presence in her life. Much of the story involves her working out her faith and fears in an attempt to rediscover God’s perfect will and plan for her life. It’s a journey each of us must take as we struggle through life’s challenges and one I hope you’ll choose to travel with Becky as she questions why God allows bad things to happen. When a tornado strikes Becky Hollister’s farm in the spring of 1854, she must leave the only home she’s ever known, and the man she’s begun to love to accompany her injured father to St. Louis. Through frequent correspondence with the handsome circuit rider back home, Becky’s heart becomes increasingly knit with his. But when word comes that he is all but engaged to someone else, she must call upon her faith to decipher her future. Matthew Brody didn’t intend on falling for Becky, but the unexpected relationship, along with the Lord’s gentle nudging, incite him to give up his circuit riding and seek full-time ministry in the town of Miller Creek, with the hope of one day making Becky his bride. But when his old sweetheart comes to town, intent on winning him back—with the entire town pulling for her—Matthew must choose between doing what’s expected and what his heart tells him is right.